I am using this photo to hook you into trying to make a shower cake. I have made them from diapers, dishtowels, bath towels, receiving blankets, and even aprons. I pinned a plain white bath towel cake video demonstration on my Janet Drury pinterest under Things To Make. 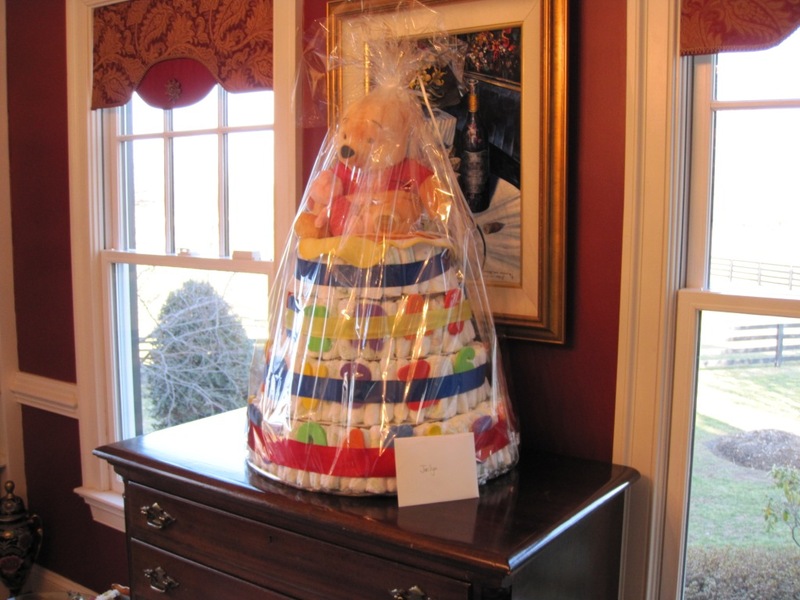 But, there are so many ways to make cloth cakes, that I wanted to give you some ways to do this. Go to Michael's. Buy a cardboard display board. Or, cut up a box you have around the house. Then decide on the circumfrence of each of your layers. I usually go into my platter cupboard and pick the largest round one. I use the platter to trace the circle on the cardboard. Or you can use the old pencil and string way of drawing a circle. Do this twice, making the second circle two inches smaller in diameter. Cut these out. Find big rubber bands. I never throw rubber bands away. This is an important item for the diaper cakes. I always use the smallest paper diapers. Buy a BIG box of them. That is part of your gift. Have a friend share the cost of this gift. Start folding the paper diapers in half. Gather five diapers in a bunch. Put the rubber band around them. Have your friend start handing you folded diapers in groups of three. Add them slowly to the first set in the rubber band. You are going to keep adding them until you have enough to fill up the circumfrence of the bigger cardboard circle. Keep adding them to the MIDDLE of the circle also, to keep the outside area intact. It takes a little practice, but is well worth the effort. Repeat this procedure for the second layer. If you are using baby blankets, you lie the blankets end to end, overlapping the ends. Try this with five receiving blankets. I get clear packing tape and tape them together. It can be removed easily by the new mom with no damage to the blankets. Start folding the lengths into the middle. Take each long side and fold to meet each other in the middle. Continue folding this way until you have the height you want for the layer. Roll this tube starting from the narrow end. When completed you have your first layer. Check to see if it fits the larger of your cardboard circles. If it doesn't, add more blankets or cut the cardboard circle smaller. The above procedure is used for bath towels, hand towels, dishtowels. Once you have your layers rolled, or rubber banded (diapers), the fun begins. Let's start decorating. For the diaper cakes, I use bibs and receiving blankets between the layers. This hides the tops of the diapers and looks like frosting. I buy cloth ribbon in 1" or 2" widths to wrap around each layer. I pin on pacifiers, small toys, etc. for decorations. I always put a stuffed animal on top. The possibilities are endless. I made a dishtowel cake for my daughter's best friend. I put a set of graduated mixing bowls inside the towels for the center. I had to tape cardboard to the outside of each bowl to make allowances for their shape. I decorated it with measuring spoons and cups. (Picture to follow). I always present my cakes wrapped in clear celaphane and tied at the top with a bow. This makes them easier to carry also.